Many classrooms are comprised of students with differing abilities ranging from students with disabilities to students with gifts and talents. While these students are sharing the same space, their differing cognitive levels must be met. Therefore, curricula must be used to meet the needs of the cognitive level that is represented within the class. The Ford–Harris Matrix, introduced in 1999, which merges the works of Benjamin Bloom and James Banks, will be re-introduced using a color code to conceptualize the model. Sample of activities using the Ford– Harris Matrix, along with pros and cons of instructing students within particular quadrants of the matrix, will also be provided. 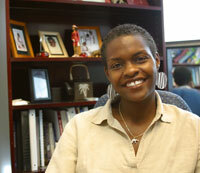 Dr. Michelle Frazier Trotman Scott is an Assistant Professor of Special Education in the College of Education. She teaches graduate and undergraduate courses in special education and undergraduate courses in diversity. Her research foci are over-representation minorities in special education, under-representation of minorities in gifted education, the achievement gap, and parenting and she has published in all areas. Prior to her appointment at UWG, Dr. Trotman Scott was a middle school teacher, a middle and high school coach, a principal of a large elementary school and a superintendent of a charter school in Ohio, and then an adjunct professor at The Ohio State University.